Yes, this one started as a DC-4 Skymaster...! In fact it operated with some well-known airliners: Scandinavian Airlines System (LN-IAE), Japan Air Lines (JA6012), Korean Airlines (HL4003) and Ansett Australia (VH-INK). It was bought by Aviation Traders (England) and rebuilt to ATL-98 Carvair. On this photo you can see quite easily that it was reconfigured to a nose-loading freighter. A unique and impressive job, originally designed for cross-Channel vehicle ferry services. As such, this particular aircraft (DC-4 c/n 42994, ATL-98 c/n 20) went to interesting places. As N5459X it operated with Hawaii Pacific Air from Honolulu and it was reregistered to C-GAAH for Hawkair in 1997. An article by Peter F.Peyer in Propliner magazine (no.79, 1999) included the remark that this Carvair had flown 42.204 hours and had made 2.129 cycles (take offs and landings), by 06Jul99. 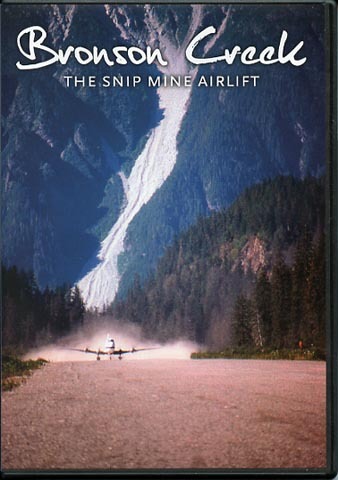 The photo above was taken on 15Aug99 at Terrace,BC. During 2002 Brooks Fuel from Fairbanks,Alaska bought C-GAAH and by December it arrived in Fairbanks. 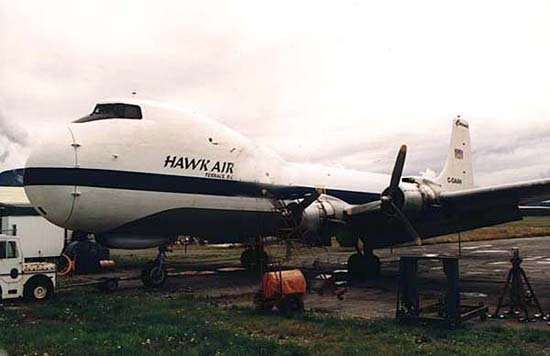 Hawkair did not get as much as they had wanted for this classic and unique aircraft, but were pleased that after several years in storage they had still been able to sell it. Hopefully Roger Brooks will be able to put it to some good use. Credits: the above historical information has been found in Piston Engine Airliner Production List (1991) by A.B Eastwood & J.Roach (published by TAHS).